Inka Hostel is surrounded by atmospheric restaurants, bars, theatres, night clubs and art galleries. It is within walking distance to the Pacific Ocean and Miraflore's main attractions (historic district, Kennedy Park, museums, Larco Mar, Marriot Hotel, business center) and only 10 minutes from the Downtown. 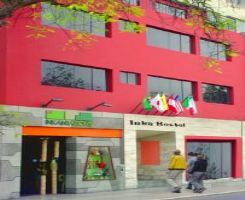 Inka Hostel situated close to Larco Mar Mall here it hits the ocean. The mall is sunken about 2 stories below street level on a high bluff that overlooks the sea hundreds of feet below. Paragliders often pass in front of the mall as they surf air currents rising up the bluff. Fun place with several discos, KFC, Burger King and Pizza Hut, sushi and iced cream places also. And a movie theater. We are located in a quiet and safe location right on the main avenue of the exclusive suburb of Miraflores.